Today I must confess- I am jealous of my sister Anna. Is it her good looks, fulfilling relationships, pretty hair? Yes to all three but the main thing I am jealous of is yesterday she started her third year at BYU and is taking my favorite class- Political Economy of Women PoliSci 472. I had three classes at BYU that dramatically impacted me- PoliSci 472, Theories on Human Freedom (PoliSci 308, which I took twice once as student, once as TA), and PoliSci 201 (Western Political Heritage, Ancient Thought, which I took 3 times- once as a student, once to improve my grade (where I met my mentor Dr. Holland, and once as a TA). I will have to do an entire post about each of these classes but today I am waxing nostalgic for Poliitical Economy of Women or PoliSci 472. This class was special for so many reasons. First, it was team taught by two amazing professors- Donna Lee Bowen and Valerie Hudson. I always found the best classes in college were the one’s that teachers had a passion for- classes they usually only teach every other year. This guaranteed a teacher with excitement for the topic and I think most anything can be made interesting by an enthusiastic teacher. Dr. Hudson is particularly amazing. She is as close to a superwoman as any person I’ve ever met. a full tenure professor, noted scholar of China’s one-child only policy (co-author of Bare Branches: Security Implications of Asia’s Surplus Male Populations), she has 8 children, 3 of her children have cystic fibrosis, she has authored 3 other books including one on women in the LDS church, and in her spare time she researched her children’s cf condition and discovered a hormone that may be associated with the condition (and had an article published in a medical journal! ), anyway the list goes on. She is an amazing person and just her example, let alone her teachings taught me that I could do great things with my life. To understand the roles women play in world society as producers, reproducers, agents of cultural continuity and change, and to render women “visible” in international and national affairs. 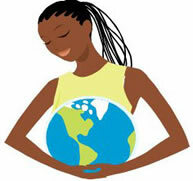 To explore in greater depth women’s choices about education, family, and work in the developing world. To investigate transnational issues directly concerning women’s lives, and the objectification and subordination of women that often results. To discuss the dynamics of change in women’s lives and in their societies, including the dynamics of religious beliefs, and to learn about programs for change that already exist. Perhaps such topics sound dull to you but for me I begin salivating at the mouth I’m so interested. I could talk endlessly about any one of those course objectives. She then says we should take this nearly universal “cognitive capacity” of mothering and use it to promote peace and connectivity throughout the world. I can’t explain why I found this so moving but for the first time in my life I finally understood why motherhood was important to the world, not just the family. Through PoliSci 472 I learned that my life as a woman mattered to the success of the world. At the time this meant much more to me than the platitudes heaped on the alter of female divinity. This was a concrete reason why women and femininity was important, even crucial. 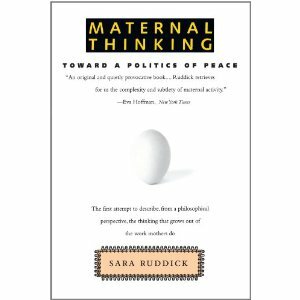 Ruddick also says that “anyone who commits her or himself to responding to children’s demands, and makes the work of response a considerable part of her or his life, is a mother”. The units on veiling and female circumcision had a particularly dramatic impact. For the latter we watched a movie where they showed a girl being circumcised. I couldn’t deal with it and literally left the classroom to vomit. Clearly not an enjoyable memory but that doesn’t mean it was not impactful. There are certain times while growing up where a child must be confronted with the evil in the world and deal with it- how lucky I was to receive such an experience within the protection and careful observation of such a great class. I remember talking with Dr. Hudson about how anyone could do that to their daughter and her inspiring me to make a difference in the world and to not give up on people. What a great teacher! We also talked a lot about the gospel and its views of womanhood. The class explored things I had heard my entire life, like that Eve was a hero for her actions in the garden, but that had never really been defended adequately in my eyes. I didn’t just want to know that Eve was noble and great. I wanted to know why. This class helped me with the why’s (not that I know the answer to every question but it helped). Plus, it taught me to ask questions of the Lord and to not be afraid of diving into topics I did not understand. I have learned that such experiences strengthen, not weaken, my faith. Check out my post on Mormon Feminism to read some of my current views. More then anything the class reinforced to me that there was room for voices just like mine (a whole class of them in fact, including the 2 teachers) in the church and in the world. This is something I have never forgotten. I grew so much during this class and that is what I am most envious of Anna. I wish I could experience that kind of growth on my own but it is hard. I am envious of the fantastic learning she is going to have presented to her and I hope she takes full advantage of the opportunity. I know I did and I am SO GRATEFUL! (PS- All 3 of the classes I mentioned were by no means easy. They were extremely difficult but that’s part of what made them so rewarding. Just goes to show don’t settle for the easy way out even in college!). Anyway, I don’t know if I have done the class justice but it had a dramatic impact on my life and I am most grateful. Did any classes have an impact on your life? College as a whole was the most transformative phase I’ve ever had and I look back on it with great warmth and nostalgia. I am so lucky and blessed to have had such great experiences. Last year I did a healthy recipe contest and got some good results. This year I would like to put out a similar challenge. As you all know lately I have been training very rigorously for my races. This leaves me with little energy to do much else some days including making food/dinner. I am far too likely to get take out or meals ready to eat at the Harmons up the street then I should. I know this is not the healthiest option but there are days when dirtying a dish, waiting 30 minutes, chopping anything seems like such a burden. And then there is the task of deciding what to make and making sure it is healthy…It is hard. So, here’s what I am looking for. There are 2 categories. 1. High fueling snackage- Yes, I know I can eat nuts and some energy bars are ok but I come home from work outs and am starving, ravenous. I would love any recipe for a satisfying snack that quenches my hunger quickly and possibly tides me over to make a good meal. Remember I have to keep the simple sugars to a minimum so try to use agave instead of sugar/honey where possible. I also love smoothies. Especially after a swim there is NOTHING better than a smoothie. 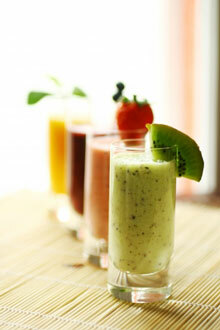 I would love some creative combinations for smoothies you might have. These don’t have to be your recipes but please make them ones that you have at least tried out beforehand. 2. Quick, easy, healthy meals- My next category is actual meals. I need meals that are low glycemic, healthy, loaded with whole grains and protein that are easy to make. This could include a recipe good for making in advance and freezing to have on hand. I like pretty much any genre of cooking- Italian, Japanese, Thai, Vietnamese, Mexican etc. I am also a pretty good cook and have a well stocked kitchen so don’t limit yourself that way. Please keep in mind that I am single so the serving size is just 1 person and then the rest either has to be leftovers or frozen. Egg dishes, breakfast for dinner, pasta, stir fries, curries, soups, salads, sandwiches, would all be good categories to think about. The healthier the better, the easier the better. They do not necessarily have to be low in fat- especially if it is the right kind of fat using olive, coconut, or grapeseed oil for instance. If in doubt, send the recipe over and I will decide if it meets my dietary needs. (Just a tip- I don’t use splenda but will try recipes with stevia. I also am open to any gluten free recipes but have no specific allergy in that regard). 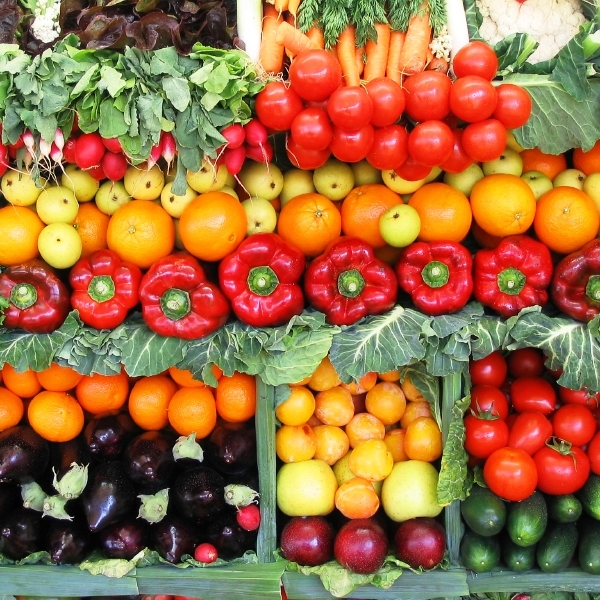 I am also more interested in healthy eating then sticking to a strict budget so while I won’t be eating black truffles anytime soon I wouldn’t put the cost of the meal as the primary consideration. Thanks! I look forward to the results. I am so fired up and upset that I can barely put my words together. What has me so up-in-arms you ask? 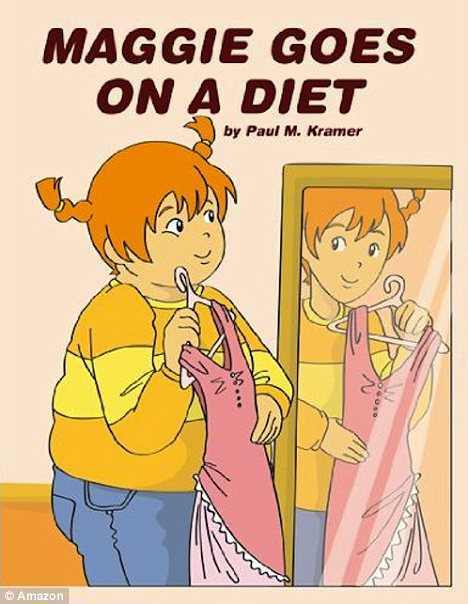 Well, I just found out about a book soon to be on the market for children as young as 4 called “Maggie Goes on a Diet” by Paul Kramer. In this book he says that poor Maggie was bullied and made fun of so she looked in the mirror and wished she could be thin. If only she was skinny all Maggie’s problems would melt a way. (as someone who was a Maggie in school such experiences are brutal and not necessarily limited to fat girls. If kids want to bully they will find a way). Seriously, what is wrong with people? 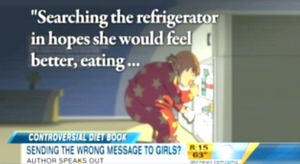 Fat children are not searching through the refrigerator in the middle of the night to calm their troubled self-esteem. Give me a break! I ate the same as everyone else but my body processed it differently. All junk like this does is make overweight kids feel guilty about every last treat, every piece of bread, they eat. Hey, here’ s a thought- how about actually teaching them about their bodies, how cells absorb food, how some people have different blood sugar responses? Many people believe children are too stupid to understand their own bodies and the complex goings-on inside. I disagree. I judged a 6th grade science fair a while back and the experiments were remarkably complex. If they can understand the intricacies of electricity or volcanoes give them a shot with their own bodies. I think we’d be surprised. In my experience anyone who actually understand how their body really works instead of just focusing on weight feels much better about themselves. Ahhh! I’m so frustrated by this. Maggie stares in the mirror at a skinny version of herself and knows that if she could only be thin her life would be better. She would be more popular and happier- a better person. You know who stares into a mirror and thinks being skinnier will solve all your problems?- the millions of girls in eating disorder clinics and rehab. I have known people going through eating disorder treatment and it is brutal. 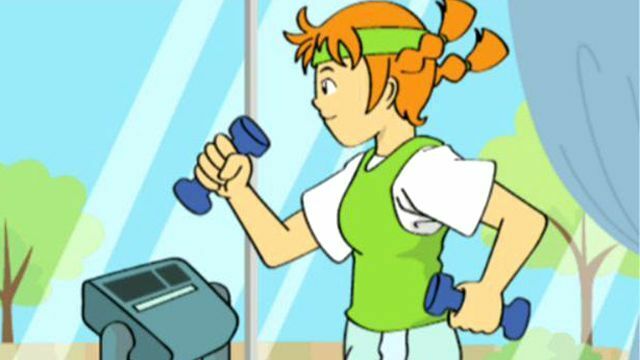 To make matters worse in the book Maggie actually does become popular after losing weight and she even ends up as a star soccer player (because if all fat people would only exercise a little they would become star athletes- almost as dangerous a promise as becoming popular). I just lost a lot of weight where’s my star athletic prowess and hidden popularity? What a terrible expectation to set up for children- on so many levels. As I mentioned in a recent post skinniness as a goal is foolish because it is a unclassifiable term- meaning who’s to say what being skinny really means? Is it Twiggy from the 60’s or is it a more muscular Cindy Crawford? Who is to say? By focusing on being skinny there is no end, nothing is good enough and most people become obsessed with it. It overtakes your life and all that matters is your appearance which is part of the reason this book made me so mad. The focus is on becoming skinny and how that will make you happy, popular and athletic. That’s just not true and it it can be a dangerous message. Maggie is also shown as losing the weight in a fast time period by “eating fruit and oatmeal” and “exercising more”. Tell that to the constantly on a diet 16 year old me who life guarded and swam competitively. Tell that to the kids who eat their oatmeal and fruit but still are chubbier than all the other kids. What are we doing in our society? Why can’t we just love people especially little children? Why does everyone have to look a certain way to be accepted? Why can’t we discuss concerns of health on their own accord without them being wrapped up in vague images of being thin. It makes me so mad. I still remember the first time I was told I needed to diet. I was 9 or 10. It was my parents and despite their best efforts it is seared in my brain for all time. At least they didn’t try to pretend I would be more popular or be good at sports if I lost weight. It still felt like a great sin I had inadvertently committed- something that was my fault but at least I knew they loved me and would accept me either way. The book also fails to mention that children are not responsible for the food that is served to them- whether it be at home or at school. (My parents did serve healthy food and I was still fat but not all parents do). What is a child supposed to do force his or her mother to make oatmeal? Tell the school lunch lady that they can only make Low GI food? Give me a break! The book treats a child as an adult who can make all her own decisions and doesn’t even mention parents or parental support. The author says he wrote the book to let children know “they are not alone in their struggles.” How does reinforcing stereotypes, creating false promises and promoting eating disorders do anything but make a child feel more alone, more ostracized? 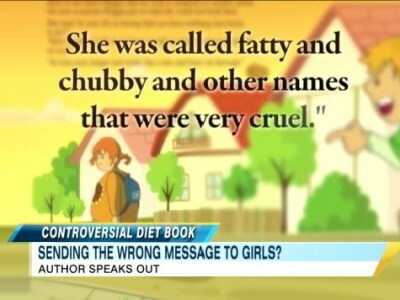 Did the author think of what a little girl will feel after reading his book, eating oatmeal and fruit, exercising and yet somehow she’s still fat? I would like to write a book like that. Maggie and her Healthy Heart. I’m seriously so mad about this I want to scream. Mainly because I know the hurt the little girls who are unfortunate enough to read this book will feel and believe me they are not turning to the fridge for comfort. They are turning to their pillows wet with tears. In my experience the only way to be happy whether skinny or fat is to accept yourself- flaws and all. We all have imperfections and yet our family loves us- we should love us too! Only then is weight loss typically successful and long-lasting. Even when you are skinny you are still the same person you were before just with a little less baggage. The core is the same. Focus on making that core strong and then you will be happy at any size. Let’s teach our children that message! Surely America we can do better than this crap. Please lets do better. “You probably hate talking about sports”. “Really?” He said in surprise. We then talked about the Utah Jazz, Jimmer, BYU football, Olympics ect. I am not trying to say that I am an expert or some kind of die hard fan but I enjoy any good competitive match/race/game. I also pride myself on being well informed on a variety of topics including sports. Unlike some girls, I can hold my own in a sports-related conversation. I think the Olympics is particularly exciting because they only happen every 4 years- making the work that much more intense, the results more amazing. There are some women who hate for their husbands to be interested in sports but I would way rather have that then video games. At least sports is something we can enjoy together. I hate video games and am truly terrible at playing them (especially anything with the controllers I can’t seem to figure out). Just ask my brother. He tried to teach me how to play Halo and it was a sorry site. I also think there is an inspirational element to sports that doesn’t exist with video games. Lately I’ve been reading Michael Phelps book entitled “Michael Phelps No Limits: The Will to Succeed”. It is a standard inspirational sports book with cliched platitudes encouraging the reader to dream big, train hard and never shy away from bold goal setting. Yet, somehow I am enjoying the book very much. Michael Phelps is such an amazing story that I don’t know if he needs great writing accompanying his book? I am getting exactly what I wanted when I bought it- a giant pep talk to get me in the water- to push me forward in life. Phelps’ accomplishments at the Olympics were so amazing that he has earned the right to be an athletic inspiration. That’s what I want from him and that’s what his book gives me. Anyway, I thought I would share with you the story of one of my athletic heroes which you may not be familiar with. 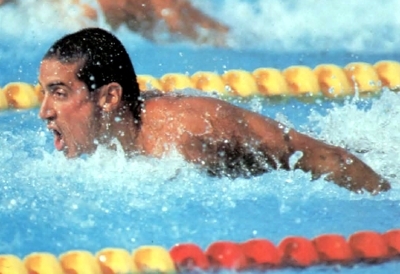 In 1992 I was 11 years old watching the Barcelona games when I heard about a swimmer named Pablo Morales. His story has always impressed me. Training his entire life he worked hard to get to the 1984 Olympics and won 2 silvers and a relay gold. Then as a national champion and world record holder in the 100 fly he was heavily predicted to win gold in 1988. With weighted expectations he had what some say was the “worst Olympic trial swim of all time” and failed to even qualify for the Olympic games. Devastated Pablo stepped away from swimming and went to law school. 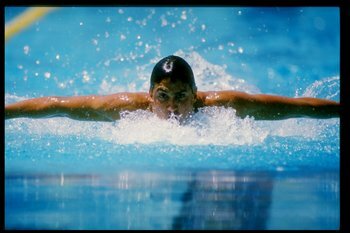 In 1992 he decided to “unretire” and came back to swimming. By this point he was 27 years old and had been away from competitive swimming for years. The magnitude of his task was great and the likelihood of failure high but nevertheless he decided to make the attempt. Can you imagine the demons that must have been going through his mind when entering the water at the Olympic trials? 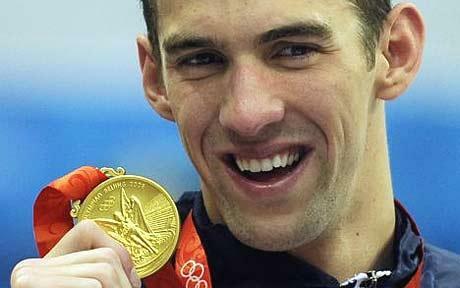 Michael Phelps says that the “mental aspect of sports is just as important as the physical part. There can be no doubt about that”. Was there any swimmer on the team who did not know how difficult a trip he had undertaken? Gone from the sport for three years, retired, totally out of the water, he had traveled east to tackle law school at Cornell. He was eating cheeseburgers and reading torts. Gone. His decision to try a comeback had come upon him last summer in a growing rush. Could he do this? His mother, Blanca, was dying of cancer in Santa Clara, and then in September she was dead. He was thinking of her and he was thinking of himself and he was thinking of the Olympics. He went off on his own little crusade, perhaps riding toward a creaky windmill, off on a fool’s errand, but perhaps not. There were no shoe contracts or seven-figure deals being offered. He simply was giving a year of his life to see how well he could do. He did it! He won the gold despite all the odds. It’s a great story! This is why I like sports because it helps me remember the potential of the human body to perform and the power of the human mind to excel. What sports moments inspire you? Please share. This is one of many I have. I hope I don't come across this way! So recently I had an interesting experience. In meeting a new person I began to share events from my life. These experiences came naturally in the course of conversation. For instance, he mentioned sushi so I spoke about the time I went to a sushi restaurant in Japan. He asked about my work, I told him about my grandparents and our family company. As we had extremely pleasant back-and-forth he made a joke about how I should use “daddy’s credit card”. Suddenly I realized that my sharing had been taken as boasting which was not my intent. I told him that I have been financially independent since I was 18 and have never had access to “daddy’s credit card”. School and my mission are really the only major expenses that I have been given help with by my family (which btw I am very grateful for and recognize was a unique blessing many don’t have). For years I have been responsible for my own rent, food, utilities, vacations etc. I actually pride myself on my independence and self-reliance, which is why the comment felt a little rude and has stuck in my mind these many weeks. I don’t want to make this seem like a bigger deal then it was because I still had a good time and it blew over. No problem. That said- I couldn’t help but ask the question: How do you talk about your life and share what you’ve experienced without seeming cocky or conceited? I don’t like to over-monitor what I say, I want to be natural, but I also don’t want to ostracize people or give the wrong impression. Its a tricky balance? Make no mistake- I have had many blessings in my life but I have not gotten a complete free pass- I am not a materialistic diva. Anyone who knows me knows I work very hard and have even been described as a “workaholic”. I know there are people who work harder than me with far less rewards but I do try to put out my best effort. Doesn’t everyone have blessings in their life which if construed a certain way could seem privileged, exclusive or special? Are you just not supposed to talk about such things for fear of sounding conceited? All that would cause is a whole bunch of complaining in conversations and personally I prefer to error on the side of boasting. I mean other people gush about their husbands, kids or new homes and I’m fine with that even though I have none of those things. I see it as them sharing the most important things in their life with me not as boasting? Especially when it comes to my fitness goals things become tricky. Exercise takes a huge amount of my energy and effort. No one can deny me that! Because it is so difficult and time consuming, I talk about it a lot and I can see how all that talk could be seen as bragging. Believe me when I say I still have a ton of work to do- about 100 lbs worth of work left to lose- but I am proud of what I have accomplished so far. This process has been the hardest thing I have ever done, and I have relied on my friends/family/trainers/blogosphere to buoy me up. I am sure at times they grow weary of the constant lifting, but I am SO GRATEFUL for it. It also is partly because of my frequent belly aching that I am particularly effusive when sharing my successes. I see it as everyone’s success. I really do. In the end, I can’t control the way people filter what I say; however, just know this- I am humbled and grateful for every blessing in my life. If I ever come across as conceited or boastful please forgive me. I promise it is not my intent. If I was going to boast of anything it would be my amazing family and friends who love me unconditionally- fat or skinny, employed or not, complaining or jubilant, they find a way to love me. My “cup runneth over” with blessings. 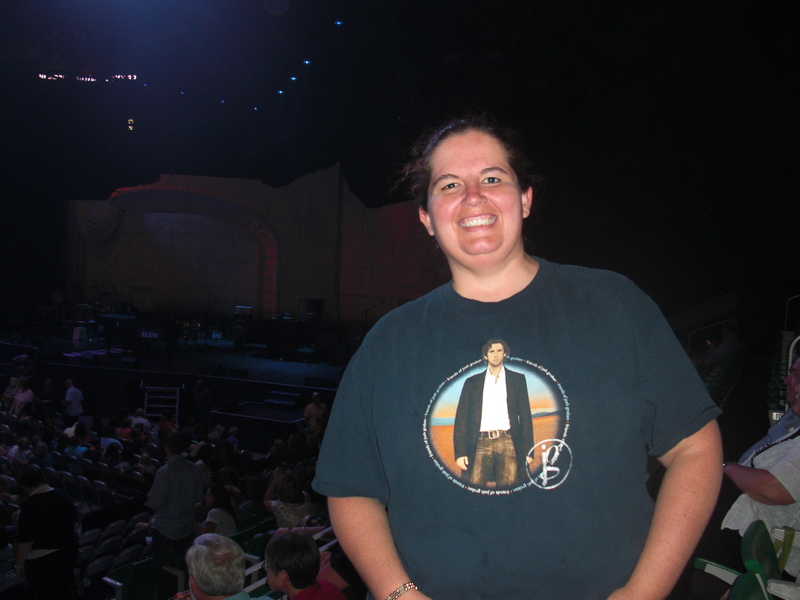 Yes that's a Josh Groban fan club t-shirt. I am in his fan club! After the excitement of the big race I had another treat (it really was the best day ever! 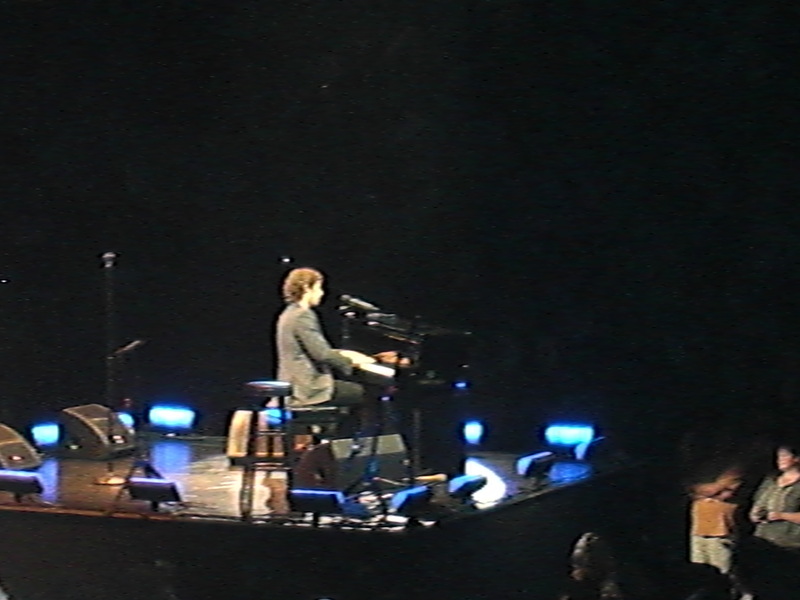 ), I was able to go to the Josh Groban concert. I had gotten the tickets as a birthday present to myself months ago. In fact, I debated about whether to enter the race or not because I didn’t want it to spoil the concert. In the end I am glad I decided to do both. (I was really tired by the end of the day but it was a good tired! A well-used, exhausted kind of tired). Josh Groban has a special place in my heart for two reasons. First, he is the same age as me and he came into fame when I started college . It might sound cheesy but I feel like his songs could be a soundtrack to my life. I LOVE his voice. I know some of his songs are over-the-top but I still love them. I can think of countless times when I’ve felt depressed, turned on his albums and felt inspired, even comforted. The second reason is in 2007 I was very depressed about my work when I decided to get tickets for Josh Groban’s Awake concert. I had high hopes going into the concert because Awake is one of my favorite albums by any artist, ever. Unfortunately I had terrible seats because I missed the purchase time while working at the temple. They were true nose bleed seats- almost as high as the arena went. To make matters worse his opening act was strange African techno music that made me nauseous. (Saturday’s openning act was an amazing piano player named Elew. It was unlike any piano player I’ve ever heard before. He even reached into the piano and plucked the strings- so cool! Check him out on itunes). In excitement I left my seat to get a drink and as I made my way to the foyer a woman approached me. “Of course” I replied and I went and got my friend Camille. 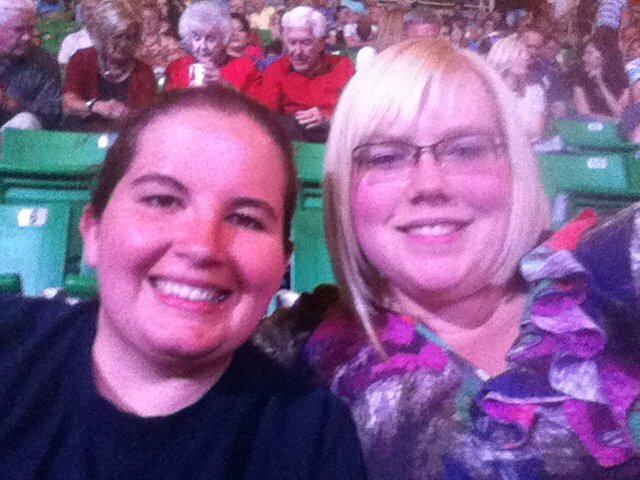 We were moved to row 13 right by the stage! There were moments Josh was singing to me and he was so close I touched his fingers (sorry to sound like a gaping teen but it was exciting!). Particularly to go from zero to hero was so thrilling. It was much better then if we had bought those tickets out right. Anyway, it was such a low time for me that I have always felt like the concert was a tender mercy. While this years concert was not quite as memorable it was still great! In a strange way it was actually more intimate because it wasn’t scripted like the last DVD ready event. It is awe inspiring to hear someone’s voice fill up a stadium like Josh Groban’s does. He is an amazing talent and I love going to his concerts. Excuse the shakiness in these clips. 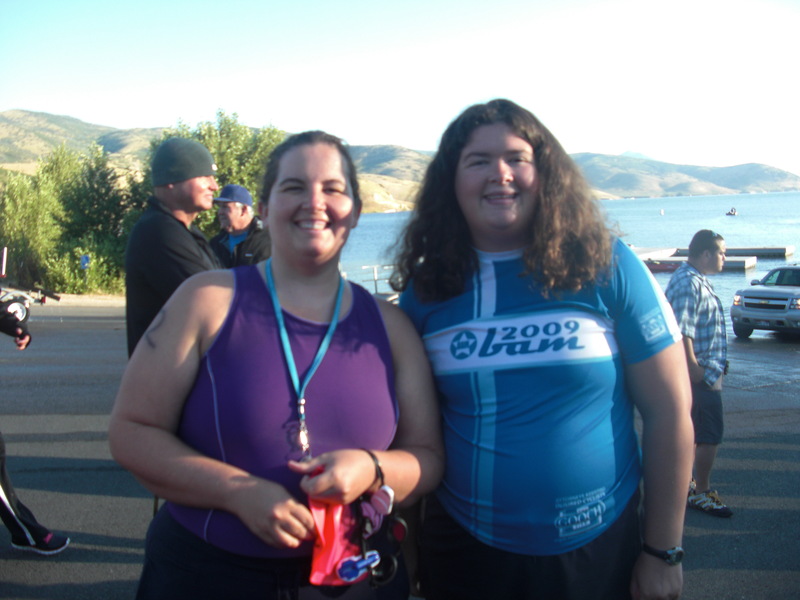 I’ve sat down to write this post several times but each time I’ve struggled to find the words to describe my experience in my first open water swim. When I try to sound triumphant it seems cloying, when simply describing the event it feels ordinary. Nevertheless, I will do my best to give you an idea of what the day meant to me. 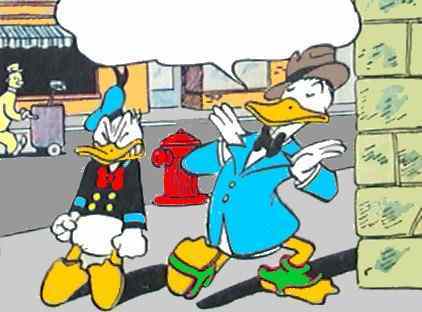 Walt Disney once said that “the real trouble with the world is too many people grow up. They forget. They don’t remember what it’s like to be 12 years old.” While this may be true with some adults, it is not the case for those of us who grow up overweight. Believe me we remember what it is like to be 12 and fat. I wish I could forget the searing images of being bullied and called terrible names. I wish I could forget being looked over and marginalized because of something that I had little control over. How might you ask did I emerge from childhood with a happy disposition (the blog is after all called Smiling LDS girl!) and confident demeanor? There are many answers including most importantly my faith but one small answer is that I found swimming. I have always loved to swim. In fact, anything with water has, and always will, make me happy- whether it is boating with my family or spending the afternoon at a neighborhood pool there is something about the water that is freeing. It was also the only athletic activity which I felt competitive and that did not flair up my asthma/bad feet. me in high school swim team photo. We changed uniforms my sophomore year which is why I got to take home the jacket I still have. When I was in high school I decided to join the swim team and thankfully they had an open enrollment policy- meaning every student who wanted to participate could. In my 3 years on the team I learned how to do strokes properly and competed in races where I actually turned in decent times. (I was one of the only girls that was willing to swim butterfly so that became a bit of a specialty for me!). Its amazing how once those strokes are in your head you never forget them. I still do my freestyle in the S shape that Coach Cowperthwaite taught me (yes, that was her name!). In fact, it is very difficult to change any part of my stroke because it is so ingrained in my body. Seared in my memory is also the feeling of weightlessness (a big thing for a fat girl to experience) that would overtake me upon entering the water. I still love nothing more than diving into water, and I agree with my sister who once said- “swimming is the closest thing to flying we have on earth”. It is freedom, it is lightness, it is happiness! In my sophomore year I took a life guarding course and believe it or not obtained my certification. I can’t explain what that meant for a fat girl- to complete a certification in something so difficult. I remember in particular we had to tread for 10 minutes with a 10 lb brick, and I did it! I awoke bright and early to face my challenging swim. I was a mess of nerves and emotion- what if I failed, what if I got a cramp mid-race and had to stop, what if my paddler didn’t show up or what if they had to cancel the race? (You get the idea). As a nod to my former self I wore my old high school swim team jacket. (Yes, for once my pack-rat tendencies paid off! I have my old swim cap also but it has a rip). 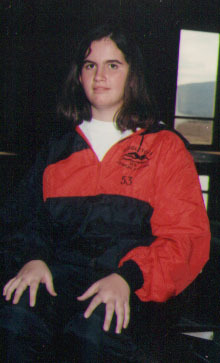 this is my old high school swim team jacket. It says Middletown Knights on the back. 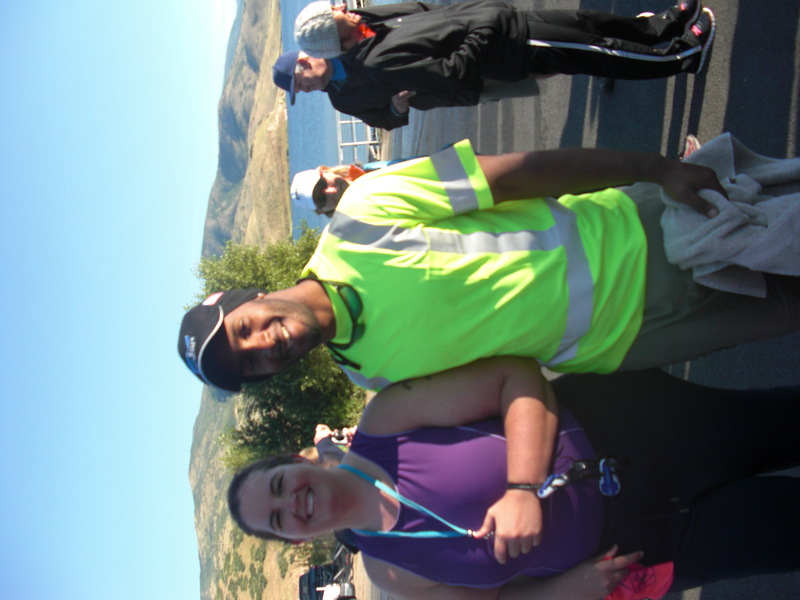 After arriving at the race I met with my paddler who was amazing. Despite having never met, he seemed to get my story and believe in me. I am so grateful for his sacrifice of a Saturday morning sleep to help me. I told him he was my ‘guardian angel’ for the day. Everyone associated with the race was wonderful and encouraging. Again, they seemed to all get that this was more then just a routine event for me. (All together I think there were about 65 racers- plus paddlers to accompany them, so it was a pretty big crowd). Then the 10 mile swimmers started (can you believe that! 10 miles! ), 10 k, 5 k (most popular) and finally it was time for my race. 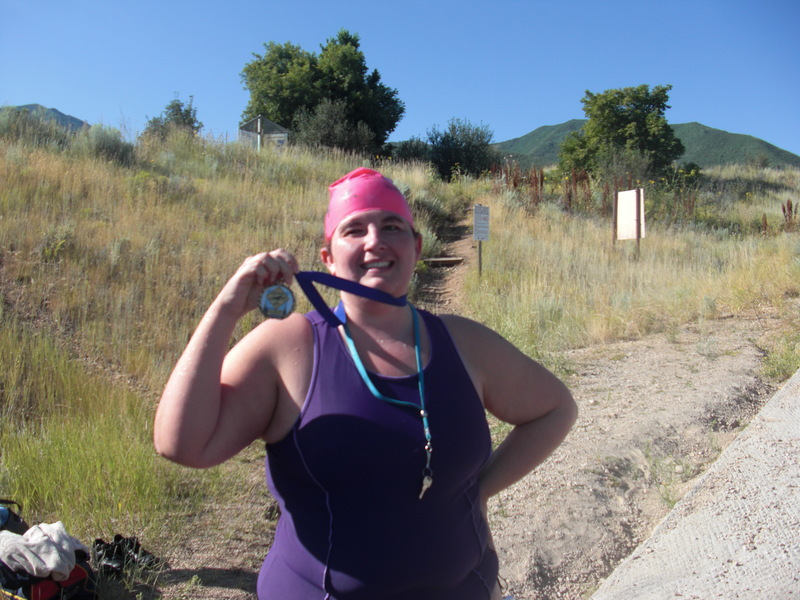 There were 10 other swimmers for the 1 mile swim including a little girl who proudly announced “I’m going to win. My sister won and so will I”. I think she came in second but still I admired her confidence. With the sound of the whistle into the water I went swimming with all my heart. I was significantly slower than my competitors but that didn’t matter to me. 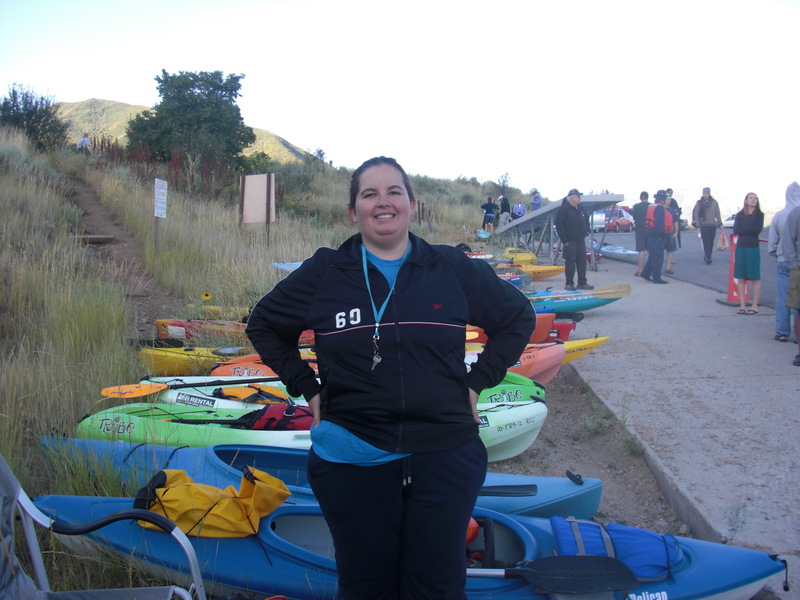 I had the encouragement of my paddler and a lifetime of love for the water pushing me forward. Plus, I could just feel the prayers and thoughts of my family, friends and trainers who have invested so much in getting me in that water. An open water swim is both a mental and physical game. I had done one mile swims before but never one quite like this. About 1/3rd of the way through it felt like I would never get to the 1/2 mile marker, and the same for the last stretch. It almost seems like a mirage and the end does not feel real until you are minutes, mere feet away. Thankfully I had my paddler and cheerleaders on the side pushing me to keep going. When I finally crossed the finish line I was overcome with emotions and actually started to cry. The ending could not have been more sweet if I had finished first. It was as if I was giving a high-five to the 12-year-old and 16-year-old me- saying we did it! I can tell you one thing- never was any medal more well-earned or more proudly displayed than the one I received for simply finishing! At the risk of sounding cheesy I would just like to say something to the young girls out there who feel they are without worth- you can do great things in your life. You are valuable and important. If I can swim a mile today and could pass that life guarding test years ago, then you can do whatever you dream of doing. Just set a goal, gather a team to help you and go and do it. There is no doubt that the year and half of this fitness quest has been full of difficulties but Saturday made it all worth it. It was truly one of the best days of my life. Thank you to everyone for your support and love. Now on to the next race- Slam the Dam in Vegas on October 1st. Life is good!